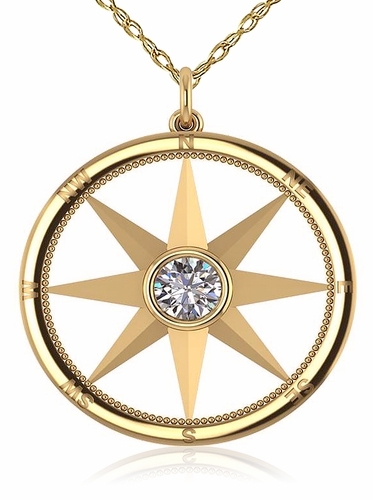 The Nautical Compass Rose Bezel Set Round Cubic Zirconia Pendant is the perfect gift for the mariner or marine enthusiast. 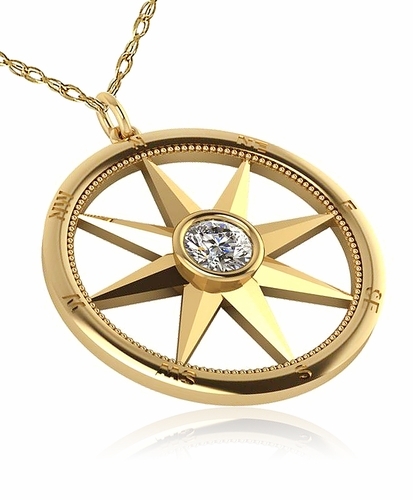 A compass rose can also be referred to as a windrose or rose of the winds and is a figure on a compass, map, nautical chart or monument used to display the orientation of the cardinal directions of North, South, East and West and their intermediate points. 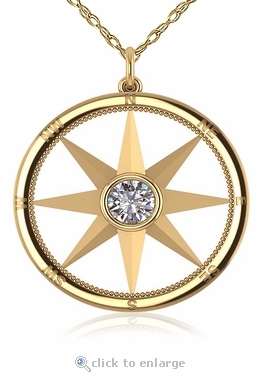 The compass rose is beautifully accented with a 5.5mm round cubic zirconia center stone that is bezel set to perfection. Our Russian formula cubic zirconia is hand cut and hand polished to exact diamond specifications for the finest lab created diamond alternative available. Choose from 14k white gold or 14k yellow gold. This pendant comes standard with a 16 inch chain length and an 18 inch length is offered, please see the pull down menu for options. The pendant measures approximately 28mm in diameter. For further assistance, please contact us directly at 1-866-942-6663 or visit us via live chat and speak with a knowledgeable representative.